The UNION HXL & HXP 8000 series are perfect for continuous distillation cycles. The distillation of the HXL8000K dry cleaning machine can be steam fed or the machine alternatively supplied with a built-in mini boiler (optional) adequately regenerating the appropriate amount of cleaning solvent before the end of each cycle. This series offers considerable reduction to occupied space while also including the standard UNION innovations and exclusive technical features. These models are equipped with two or three independent solvent tanks with round bottoms, designed to prevent moisture and associated bacteria problems, with a large front facing sight glass. Innovation and Superior Performance Our high-effeciency, single-stage inline water/solvent separation system assures maximum solvent quality control and purity. Large sightglass let you visually inspect levels at each stage of the separation process. 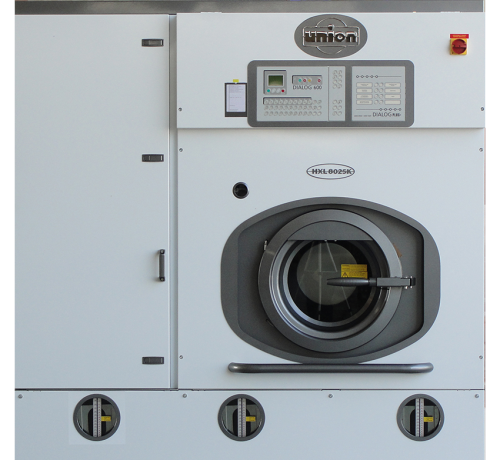 The Ideal Drycleaning System For All Alternatives! Newly designed, drying chamber and refrigeration unit with (easily removable condensing coil) saves energy and reduces your operating costs.